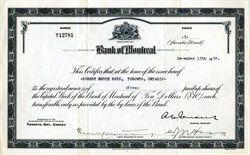 Beautiful uncancelled stock certificate from the Bank of Montreal issued in 1954. This historic document was printed by British American Banknote Company and has an ornate border around it with a vignette of the company's logo. This item has been hand signed and is over 60 years old. Bank of Montreal is Canada's fourth largest bank, and is classified as a Domestic Chartered Bank (Schedule I). It also has substantial operations in the Chicago area and elsewhere in the United States, where it uses the Harris name. Bank of Montreal was founded in 1817, making it Canada's oldest bank. It operates under the corporate brand BMO Financial Group (where "BMO" is pronounced "bee-mo"); its banking operations in Canada are now marketed as BMO Bank of Montreal. First Canadian Place, Toronto - Canada's tallest office buildingBank of Montreal is Canada's oldest chartered bank. 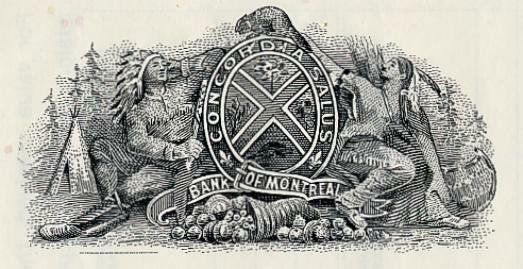 The bank opened in Montreal, Quebec on November 3, 1817. For the first few years of its existence, the Bank occupied a small building on Saint Paul Street. John Gray, a retired dry goods merchant, was the bank's first president and Robert Griffin worked as the first bank teller. Bank of Montreal served as Canada's central bank until the creation of the Bank of Canada in 1935. It played a major role in the development of the country, taking part in the financing of the first transcontinental railway in the 1880s. The first Canadian bank to open a branch abroad, Bank of Montreal is today a major international bank with 1,100 branches across Canada and around the world. In 1977, BMO's operational headquarters moved to Toronto, while its legal head office remained in Montreal.